The Barbados bullfinch and Carib grackle can pass the popular animal cognition test of string-pulling, but this ability may be unrelated to performance on six other cognitive tests, according a study published August 17, 2016 in the open-access journal PLOS ONE by Jean-Nicolas Audet from McGill University, Canada, and colleagues. String-pulling is considered one of the most complex problem-solving tasks for animals. While many birds, including several corvids and parrots, are capable of string pulling, the association between string-pulling and cognitive traits has not been fully explored, and most previous studies were carried out using captive birds. Audet and colleagues tested the string-pulling ability of wild-caught Carib grackles and Barbados bullfinches by suspending food in a cylindrical container that was attached to a perch using string, which could be reached by a series of coordinated actions. To determine if individual variation in performance could be predicted by results on other tasks, the authors compared the birds' performance on string-pulling to six other behavioral measures, including problem solving, temperament, and learning. Two of the 31 grackles and 18 of the 42 bullfinches passed the string-pulling test. Due to the low number of successful grackles, further correlational analysis was not possible. However, string-pulling performance in bullfinches was found to be unrelated to any of the other tasks tested. The authors also found that string-pulling performance improved in some birds when given a second chance, suggesting that in at least some individuals, motor trial-and-error learning may have occurred. However, the authors note that because birds included in this study were wild-caught, the possibility that differences in individual experience in the field may have affected performance cannot be excluded. 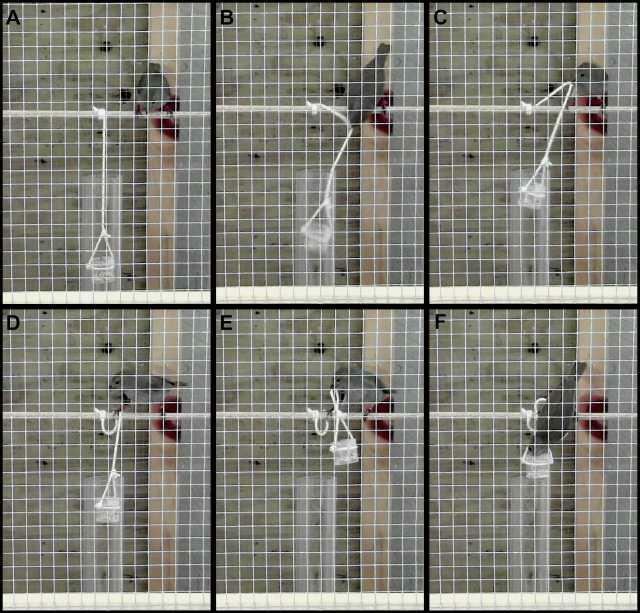 The authors suggest that many skills may be involved in a bird's performance on the string-pulling task.